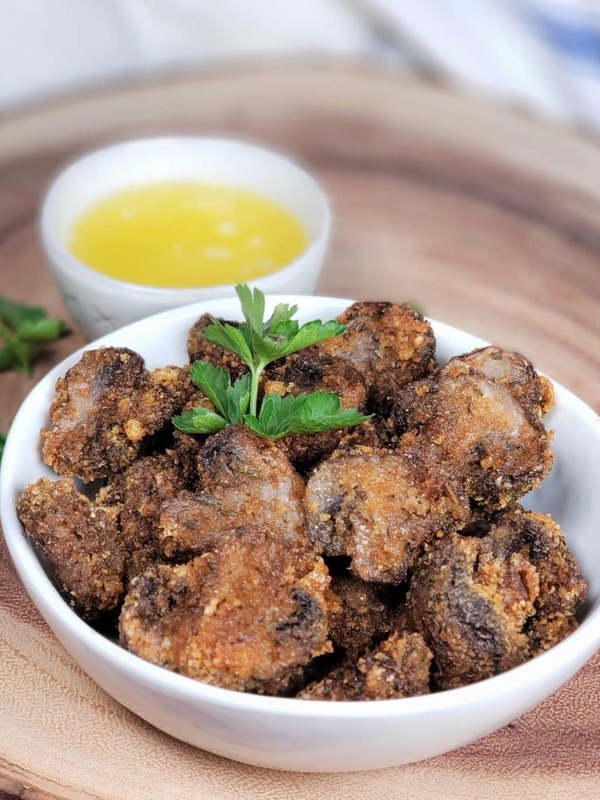 Low Carb Air Fryer Garlic Mushrooms with garlic butter are juicy and full of flavor, Keto breaded mushrooms are the perfect appetizer or snack. Fried or stuffed mushrooms are always one of the most popular appetizers on restaurant menus, hosted parties and at home. 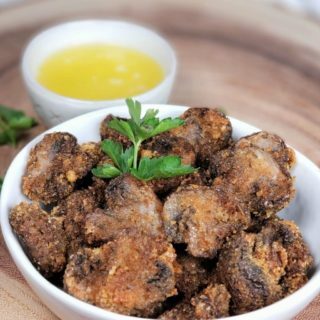 My Air Fryer Garlic Mushrooms with a crispy seasoned breading are low carb and keto. 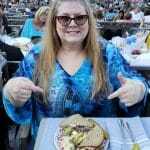 I use my favorite air fryer, which is the GoWise Air Fryer for this recipe. 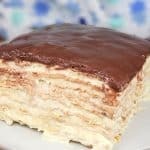 They will blow your mind and are so delicious, you will want them over and over again! Juicy garlic mushrooms may cause a breaded mushroom addiction. Napkins are definitely necessary. You have been warned. As always, feel free to adjust the seasonings to your preferences, but here’s how I make them. Mushrooms – Cremini are best for this recipe. They have so much flavor and are so juicy. Pork Rinds – I promise you, you cannot tell pork rinds are used. I hate them too!!! The exact amounts of each ingredient is found on the recipe card down below. 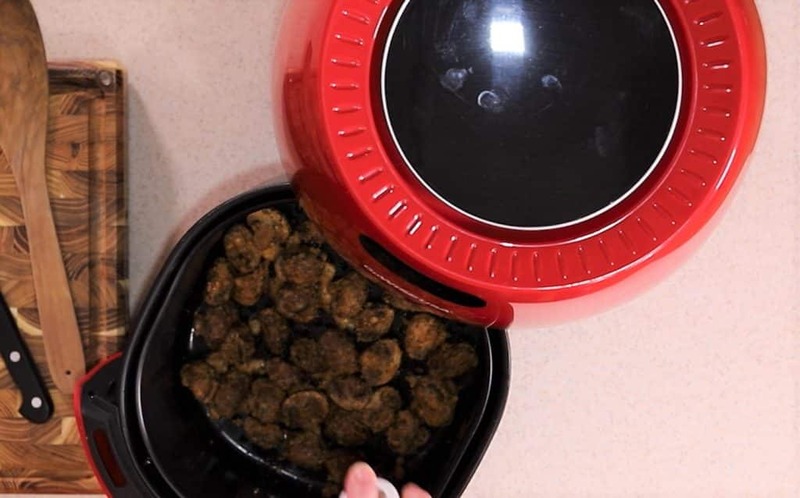 Just Take Me To the Best Air Fryer Garlic Mushrooms Recipe Ever! 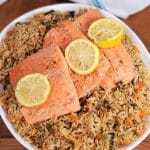 If you would rather skip right to the recipe or video, please scroll to the bottom of this page, where you will find the full and complete printable recipe. When washing mushrooms, use a wet paper towel or clean sponge and remove the dirt. The tip of the bottoms (the flat dark part) should be sliced off and tossed. What Mushrooms to use for Air Fryer Garlic Mushrooms? Cremini mushrooms are my preferred mushroom to use. They are young or baby portobella mushrooms. Their flavor is much more sophisticated than button mushrooms, which are quite bland. 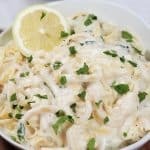 Read more about cremini mushrooms in my Instant Pot Creamy Parmesan Garlic Mushroom Chicken recipe. Whole or sliced mushrooms can be used. Make sure the mushrooms have been completely towel dried. Pork rinds come in many flavors. I generally like to use the plain ones, so that I can season them up myself. Using a food processor is the quickest way to grind the pork rinds into crumbs, similar to bread crumbs. If you don’t have one, consider buying one. 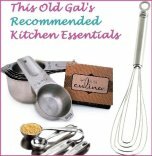 It is so convenient and I use one in so many recipes. My Instant Pot Greek Meatballs for example make a recipe with many ingredients super easy, as everything is just tossed in. No chopping. A rolling pin and baggie will work too. Another fantastic recipe using pork rinds is my Low Carb Breaded Pork Chops in the Air Fryer. Tender and juicy and delicious. Try it. All the seasonings go right into the food processor and the entire garlic mushroom crispy coating is all made in a flash. Can Air Fryer Garlic Mushrooms Be Made Ahead of Time? Yes, I do believe they can. You can totally prepare the breading and have the mushrooms all ready to go. 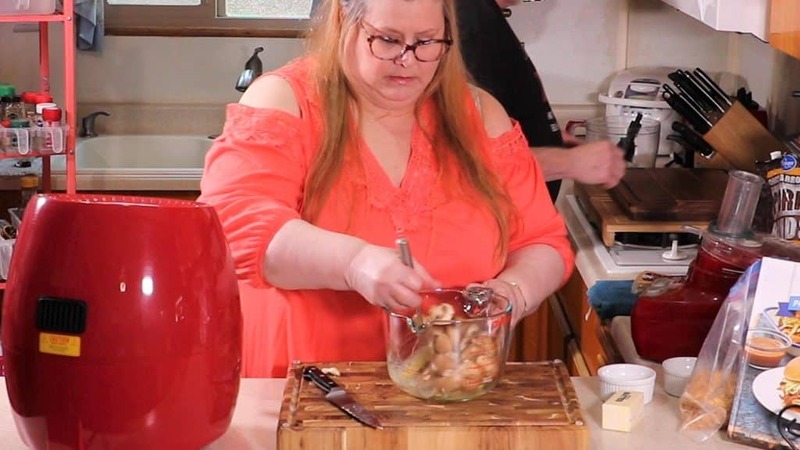 For convenience purposes, since I know you are going to love the mushrooms so much, you can prepare them for cooking and then flash freeze them to cook whenever you have a hankering. For coating meat and other veggies, another pork rind coating to make is my All Purpose Low Carb Seasoned Breading. It is always best to buy a chunk of cheese, whether it be Parmesan or Asiago for this recipe. Keep this in mind for when buying cheese. Using a block of cheese and doing the processing yourself, whether shredding, grating or pulverizing is quite easy and so much better tasting that the packaged stuff, which has already been shredded. 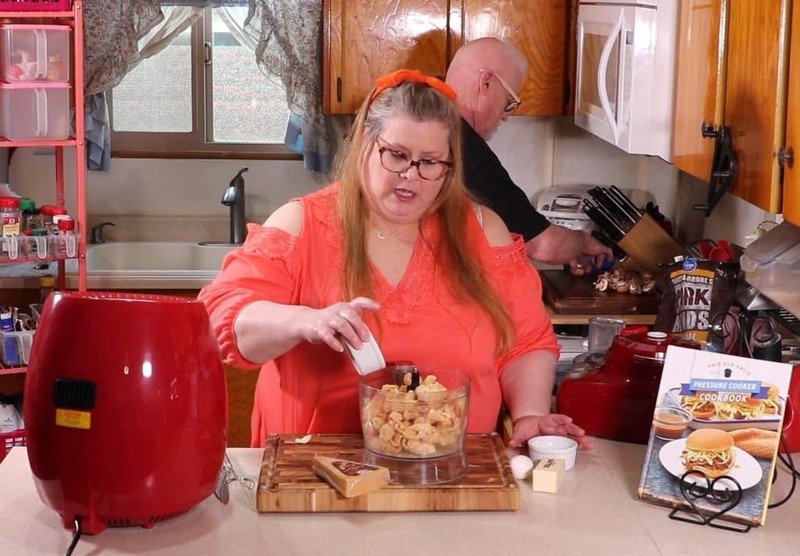 In this recipe, the chunk of cheese can be added right into the food processor, so the prep time for this recipe is truly minimal. 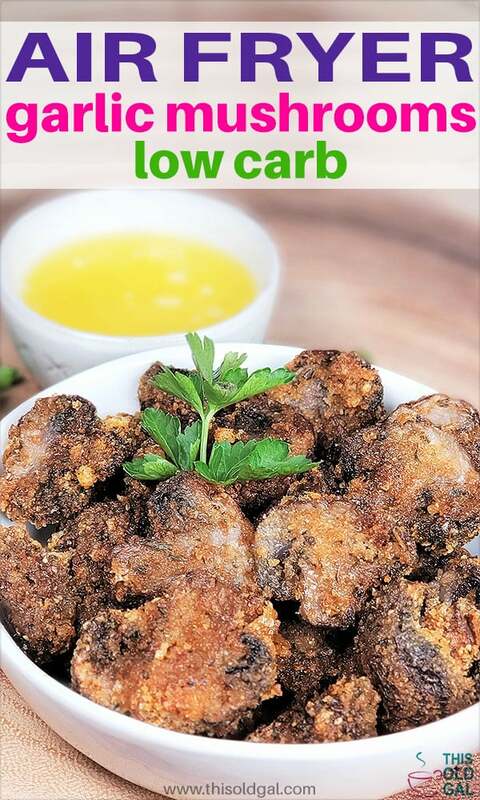 In just a couple of seconds, you have a perfect keto breading for Low Carb Air Fryer Garlic Mushrooms. How Can I Use Air Fryer Garlic Mushrooms? Snacks at any time of the day. As a side dish to my Air Fryer Rib Eye Steak. 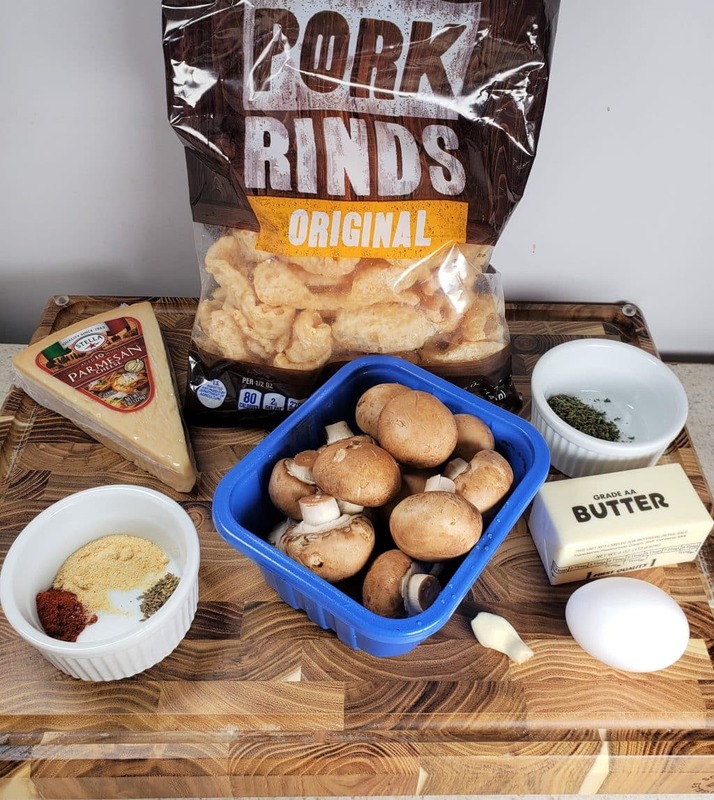 Air Fryer Garlic Mushrooms make a terrific keto and low carb snack and can be enjoyed any time of the day. 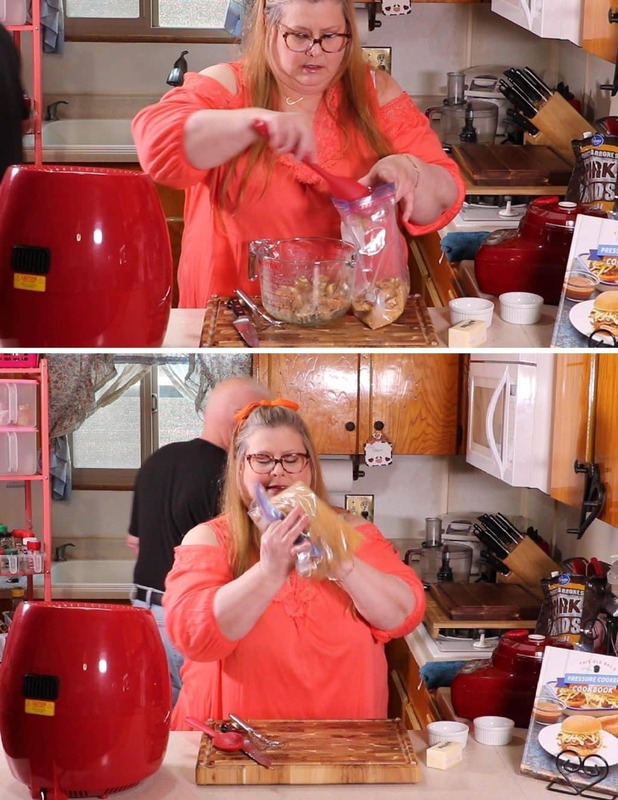 The easiest thing to do is to just pour the crumbs into a baggie. Egg wash is just eggs, which have been whisked or beaten for the purpose of using them for coating when making breaded food. Egg wash is also used in baking, to help bind the pastry dough together, prior to cooking. It is also used to help the pastry dough to darken, like when it is lightly brushed on to a pie crust. 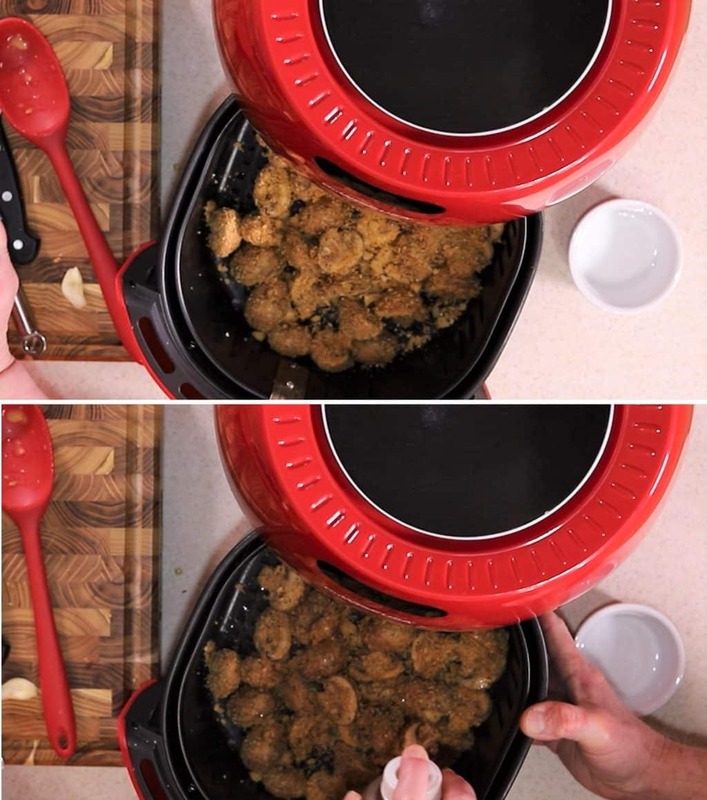 When used in making breaded food like fried garlic mushrooms, the egg wash ensures the crispy crumb coating to stick. In the example of my Air Fryer Zucchini Zircles, the eggs can be mixed with another liquid like milk, oil or butter. Give the mushrooms a good coating of the egg wash.
Can Air Fryer Garlic Mushrooms Be Frozen? They can be frozen, but what I suggest is to freeze them after preparing. By the time it takes to reheat the cooked garlic mushrooms, you could easily cook the raw mushrooms and have freshly cooked Air Fryer Garlic Mushrooms. 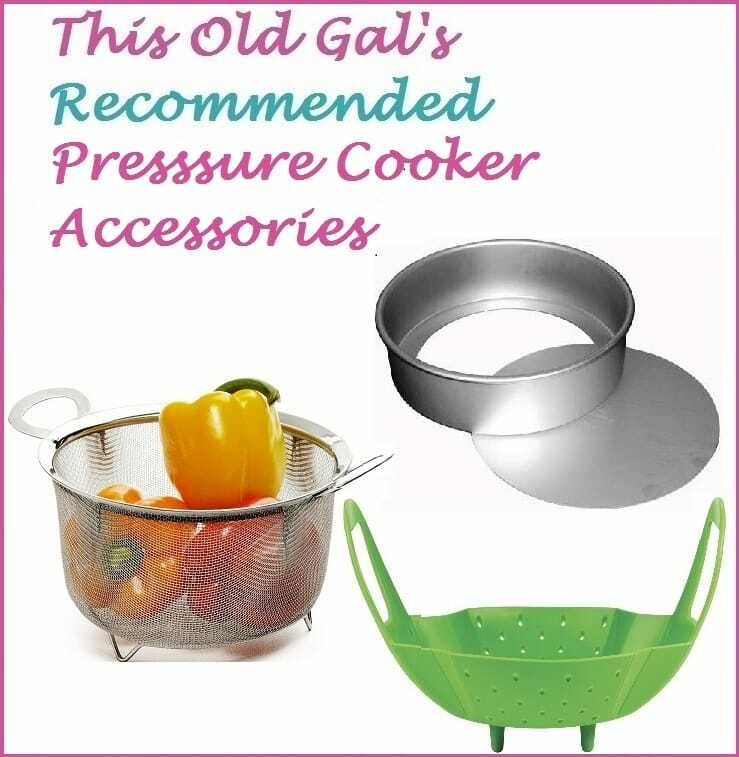 This ingredients and method of this recipe can be used to make other air fried vegetables, such as green beans, cauliflower, broccoli, onions (although onions are not low carb), zucchini and other types of squash. If you want to use a bowl or container for coating the mushrooms, that works fine. Make sure they are completely coated. Shaking the mushrooms with the coating in a baggie is pretty quick. All brands of air fryers cook a bit differently. Regardless of the cook time and temperature any recipe in an air fryer may need adjustment. the air fryer I use, always cooks very evenly. Should I Grease the Air Fryer Basket? 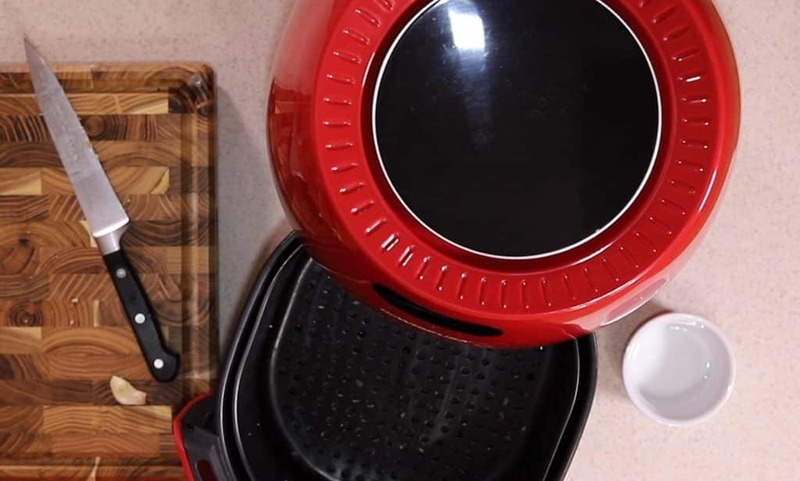 It is generally a good idea to grease the basket of the air fryer, so that the food does not stick. 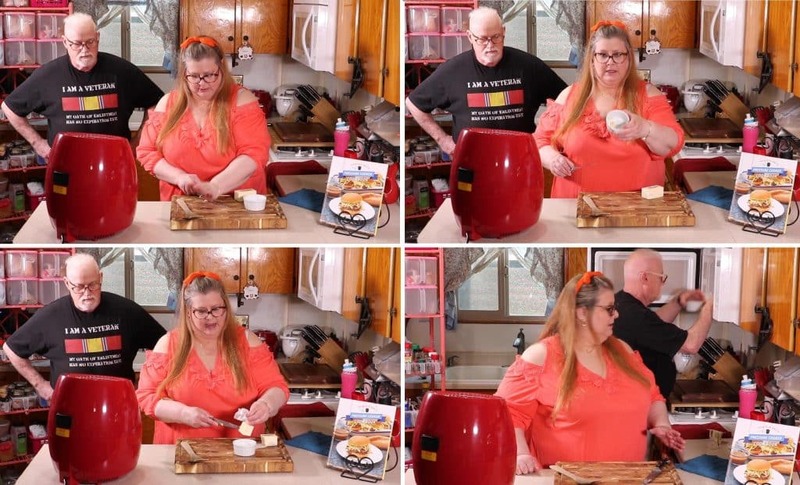 See my guide on How to Properly Season air Fryer Basket for more tips. Coconut oil is good to use for greasing, but use whatever you like. Pork rinds are very oily, so only a light misting is needed. My preference for misters/sprayers is the Fine Life Oil Mister. A quick misting oil and a shake at the halfway mark is good. Fresh garlic v. garlic powder. There is a time and place for both. At the high temperature in the air fryer, fresh garlic would burn and turn bitter. The garlic butter dipping sauce uses fresh garlic and is fantastic with the Air Fryer Garlic Mushrooms. Grab a ramekin and melt the butter in the microwave with the garlic. 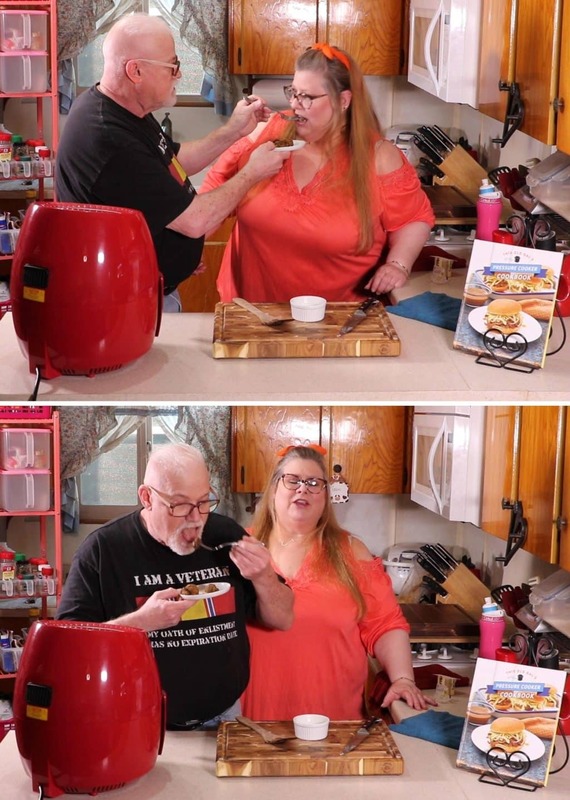 Check the first photo above and the video (which is below). All I do is smash the clove of garlic with my knife. Ed, Leave Some Garlic Mushrooms for Me! 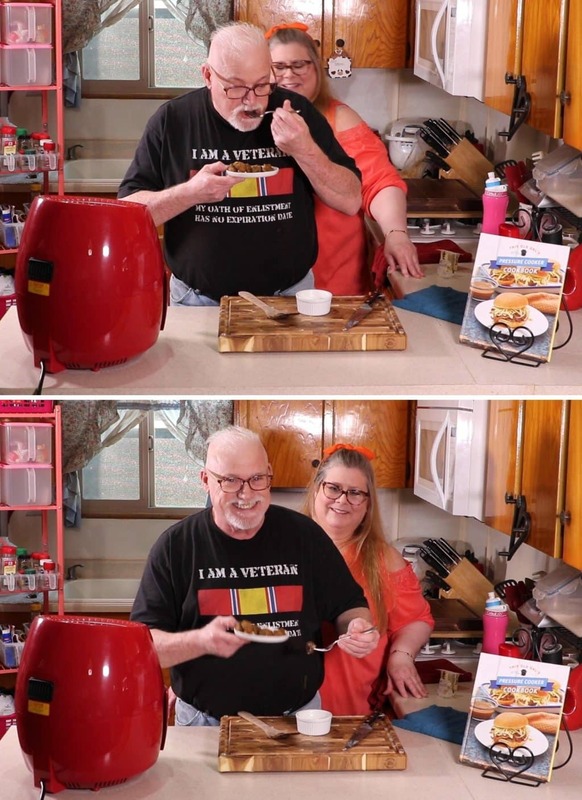 Seriously, this man loves Air Fryer Garlic Mushrooms. He really did not want to give me any. I got that small one and then Ed ate the rest. Watch the video if you don’t believe me. 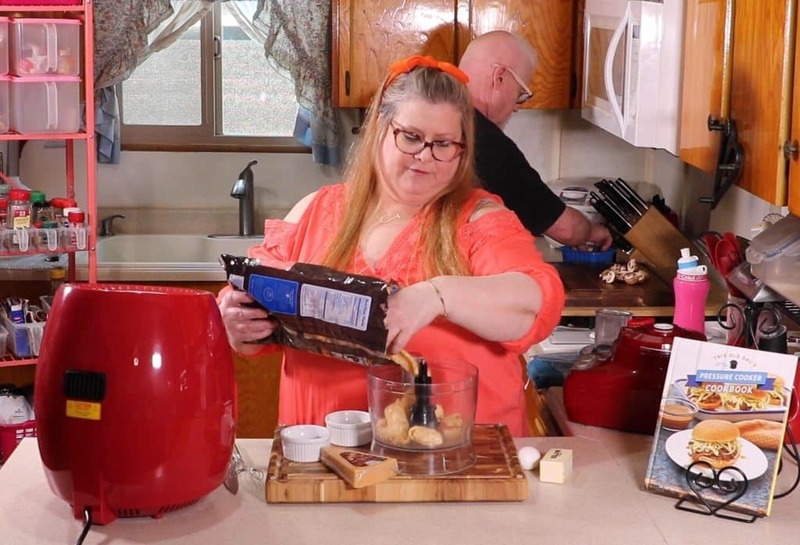 Watch the video below as I walk you through every step and detail of this recipe. I’ve given you a ton of information above, but sometimes a visual of the process helps so you can follow along. 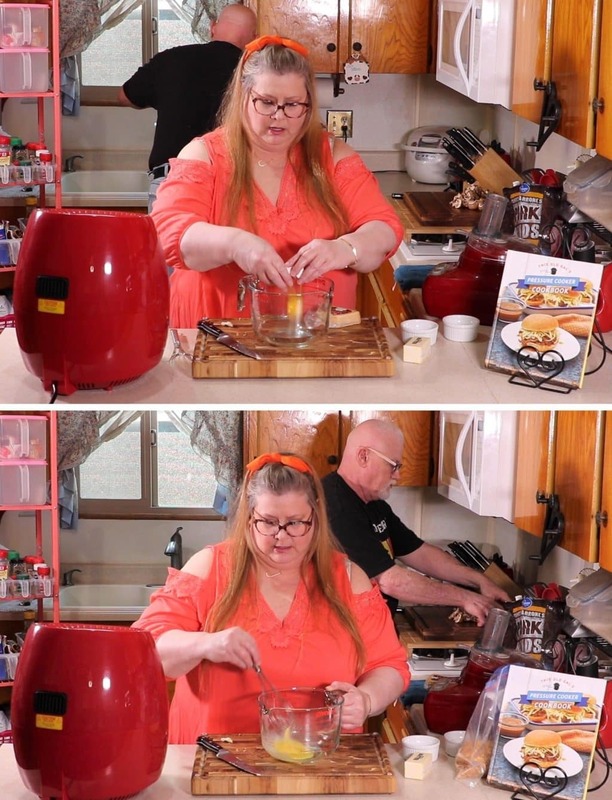 I have my own cooking show on my YouTube Channel, so be sure to check it out and subscribe! 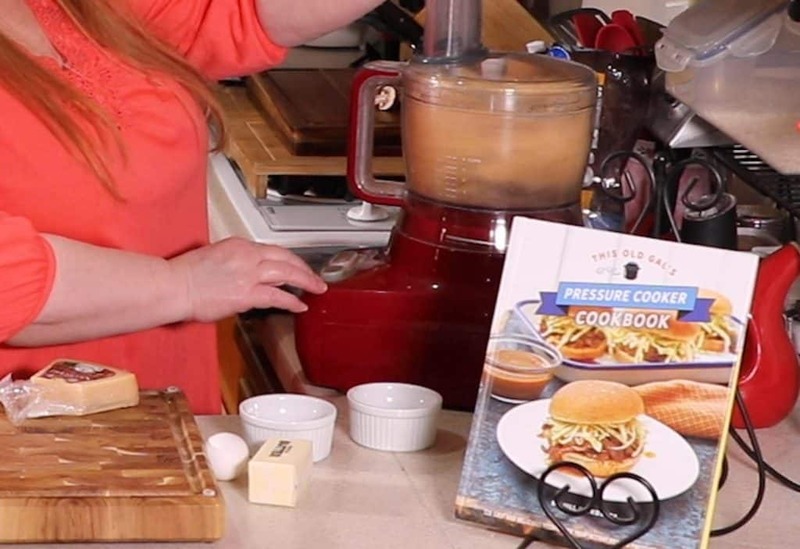 Watch my video and then scroll to the bottom for the printable recipe card. Try to use mushrooms, which are the same size. If they are tiny, don’t cut them in half. Carefully wash dirt off mushrooms, being careful not to pull out the stem or rub the meat off. 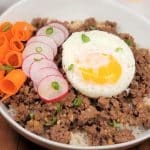 Use a food processor to quickly make the crispy coating. 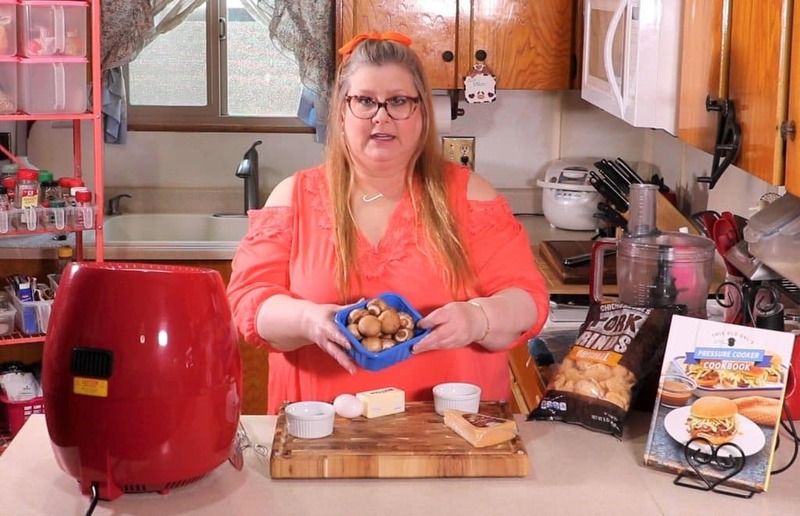 Air Fryer Garlic Mushrooms make a wonderful presentation. They are so pretty. They go over really well at dinner parties and hosted parties and look awesome being carried around on trays. People will fight over getting them first. Carefully wash mushrooms and slice off just the bottom of the stem. Pat dry mushrooms and cut in half. 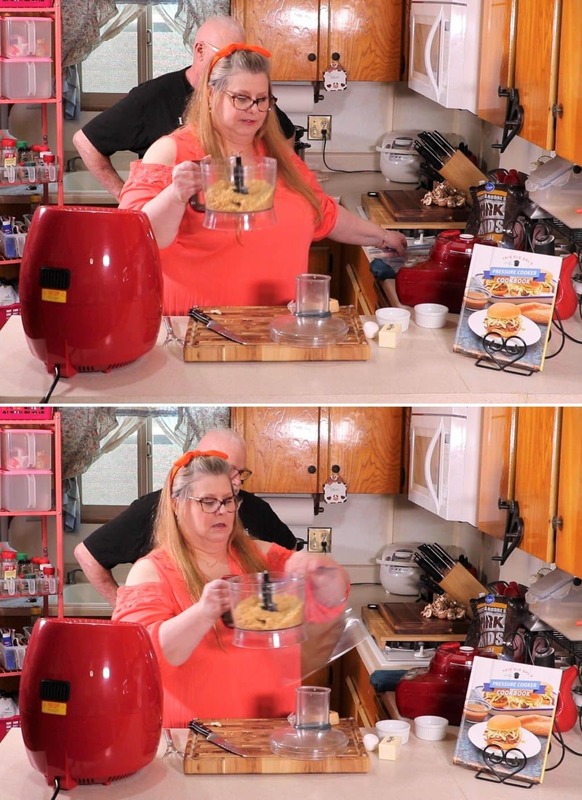 Crack an egg into a medium bowl and whisk well. Add mushrooms to egg wash and mix to coat completely. To the bowl of a food processor, add pork rinds, Parmesan cheese, parsley, garlic, salt, paprika and basil and process until well combined. Dump dry mixture into a medium bowl or baggie. Coat basket of air fryer with coconut oil and and place mushrooms into basket. Lightly spray with oil. Cook at 380 degrees for 10 minutes, shaking/turning over the mushrooms half way through. 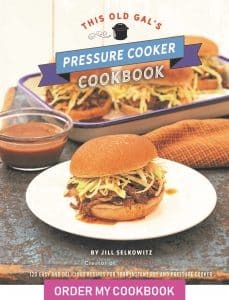 After 10 minutes, increase temperature to 400 degrees and cook for 30 seconds to one minute to crisp. Remove mushrooms to a plate. Serve mushrooms with garlic butter. Smash garlic and place into microwave safe bowl. Add butter. Microwave butter for 15-20 seconds or until melted. Cremini mushrooms are the tastiest to use in this recipe. Try to use mushrooms, which are the same size. If they are tiny, don't cut them in half. 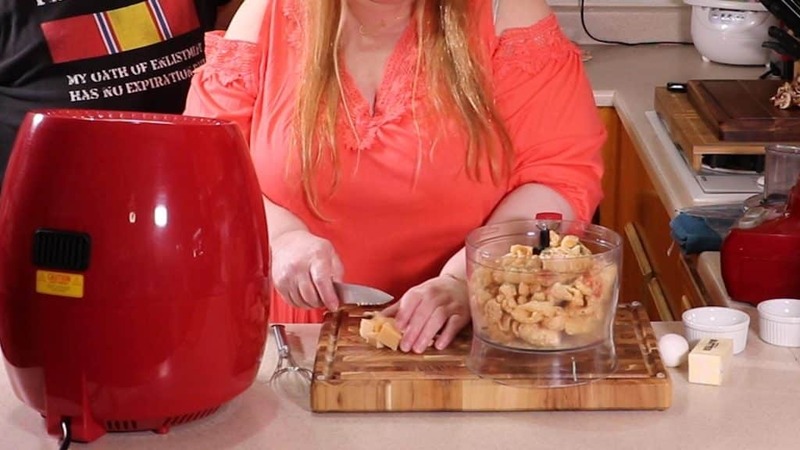 I watched you make on your live show, but I cannot find pork rinds here in Nova Scotia. What else can I use (I was thinking Panko crumbs), what do you think? They sell pork rind crumbs on Amazon and they are very good.